Posted on December 8, 2017 at 3:44 pm. This week has been a busy and productive week in our classroom! We learned all about Arctic Animals and what kinds of animals live in the Arctic! We also learned that animals in the arctic are white,gray,and black in order to camoflage themeselves. We also learned that many arctic animals, such as Polar Bears and the Walrus have a layer of fat, called blubber, which helps them to stay warm in the icy water as they hunt for fish. 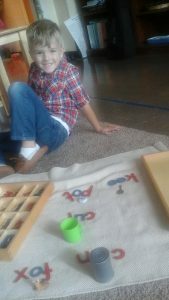 Ms. Mel also worked with the children during their afternoon group time on counting in Italian! 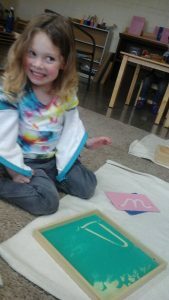 Proud of her work writing her letters in the Sand Tray! Proud of her work writing “t ” on the chalkboard! Also a great predecessor to practicing letter formation before writing on paper! 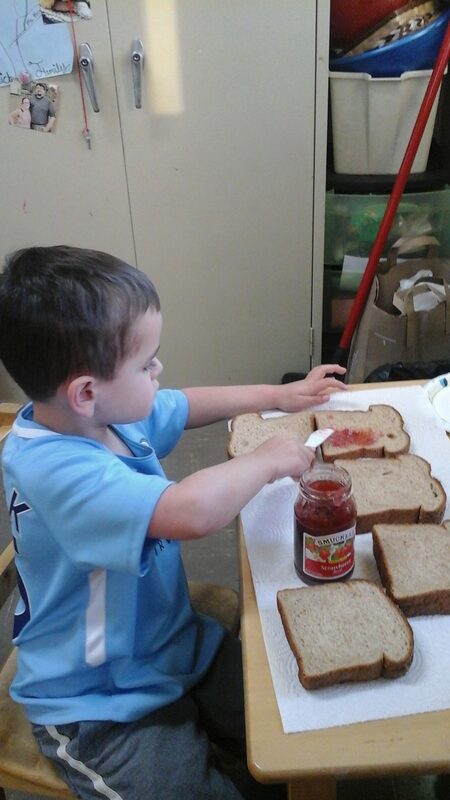 Helping to take responsibilty for our classroom by preparing snack! Thank you to Ms. Schnee (Harper’s mom) and Ms. 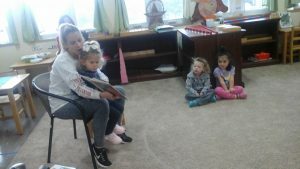 Brandy (London’s mom) for coming to read to us this week! -Learning about the Parts of the Orchestra. -Listening to different kinds of Orchestra Music. -What is the job of the conductor? Posted on December 3, 2017 at 11:17 pm. It was so nice to be back after a wonderful Thanksgiving Break! Before break, we enjoyed making Pumpkin Peanut Butter Soup and homemade bread together! We also enjoyed learning about the First Thanksgiving! This week, we learned all about the weather! We learned about how clouds are made up of water vapor and when the droplets become heavy enough gravity pulls them back toward the earth as rain drops. We also made a chart to track the weather this week to see how many sunny, rainy, cloudy, and snowy days we had this week. As a wonderful surprise for the end of November, we had more sunny days! 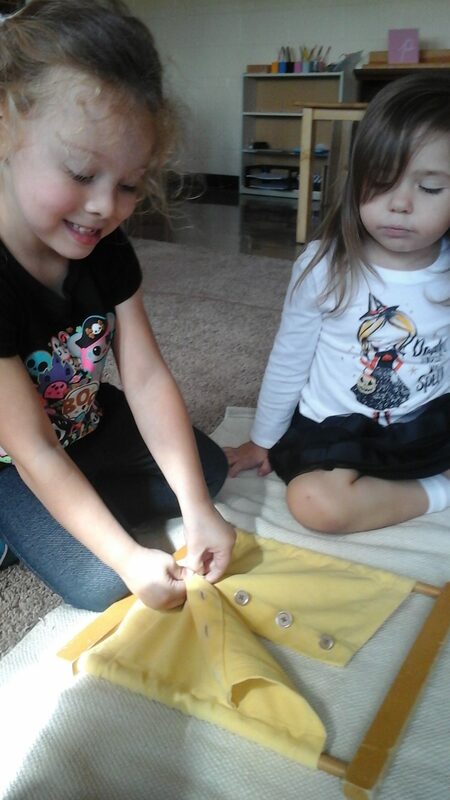 We also discussed what kinds of clothes we wear during different kinds of weather. Enjoying working on the Basting Work in the Practical Life area! 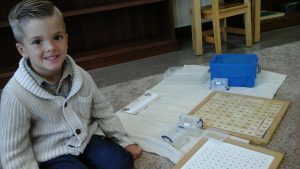 This material helps indirectly prepare the child for reading, by moving the water from left to right and also helps to develop their pincer grip. It also helps to develop their sense of order, concentration, coordination, and independence! Working on the Five Square Chain from the Math area! 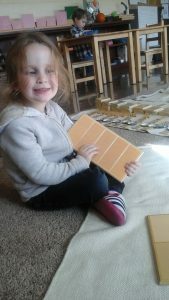 This material is a concrete way of introducing the child to squares and square roots! Working on tracing the puzzles from the Science area! Puzzles are a great Pre-Reading material and tracing them helps to steady the hand for Handwriting! -Learning how Arctic Animals stay warm. -Why do many Arctic Animals have white fur, skin, or feathers? Posted on November 18, 2017 at 12:17 am. This week we have been learning all about Turkeys and how Turkeys are a part of the bird family! The children also enjoyed discussing what they are thankful for! Please take time to check out our bulletin board and check out what your child is thankful for! 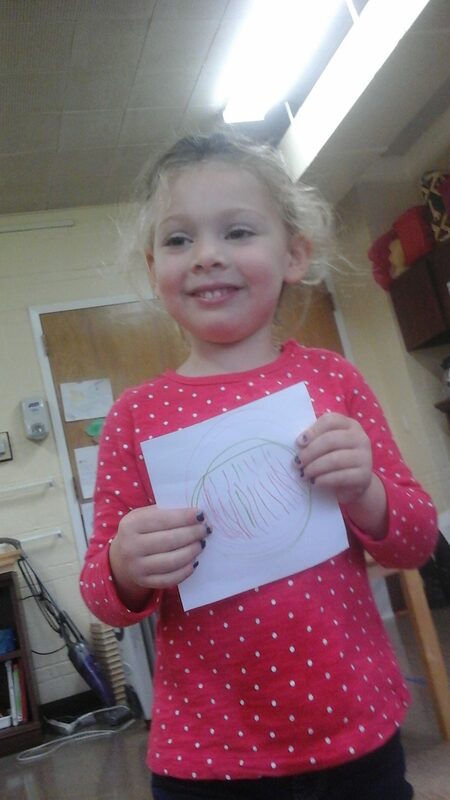 Proud of her work on the Lacing Cards! 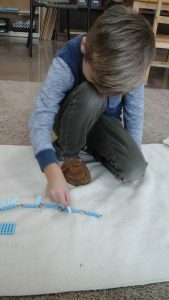 by lacing the string through the holes in the board, the child in indirectly working on increasing their sense of organization, concentration, coordination, and independence! Smiling after working hard on the Geometric Solids! 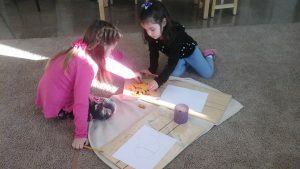 By working on this material, the child learns new vocabulary by learning the names of three dimensional shapes and they are also indirectly prepared for Geometry! Our class enjoyed a special visit by an AMMS alum who came to read them a story! Posted on November 10, 2017 at 1:53 pm. This has been a wonderful week in our classroom! This week we have learned all about Kindness! We discussed how being kind means we treat others the way we would like to be treated. 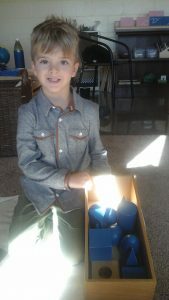 The children also filled up our Kindness Jar, so we were able to do something kind for another class and go visit them! So much fun! Proud of her work using the Metal Insets! By tracing the shapes and practicing drawing straight lines accross, the child is preparing their hand for Handwriting! 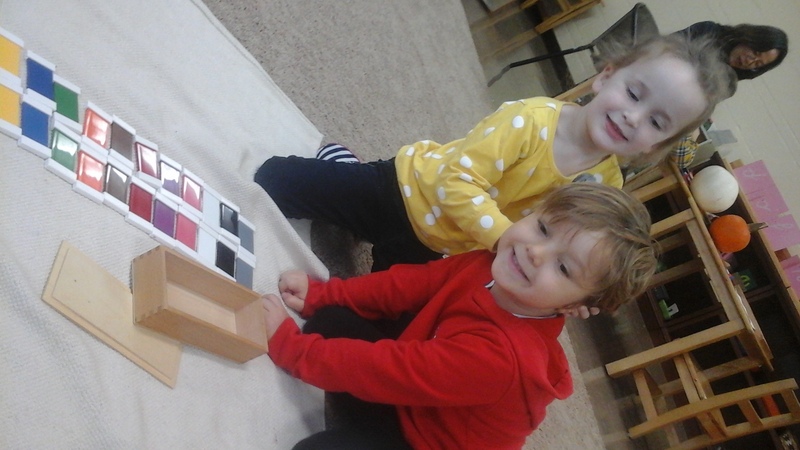 Working together to match colors in the Sensorial Area! Proud of her work on the Rhyming Cards in the Language Area! Our class filled up our Kindess Jar, so we were able to do something kind for another classroom and go visit them! 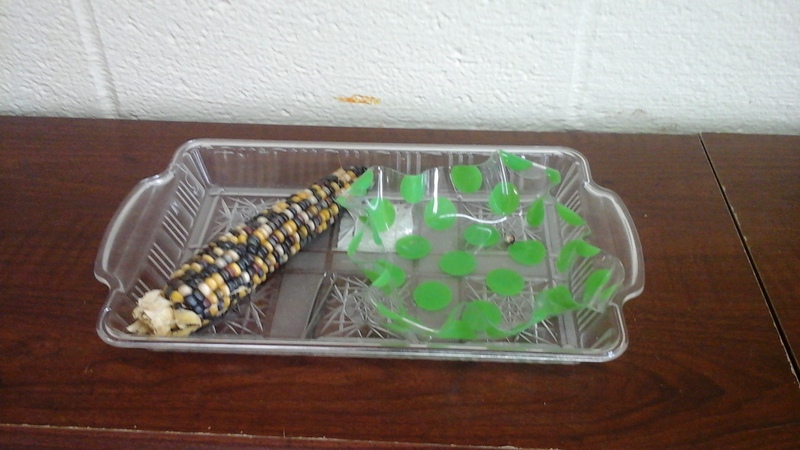 We decided to share our favorite work from the Practical Life area, Corn Tweezing, with Ms. Kate’s class! -Singing Turkey and Thanksgiving Songs. Posted on November 3, 2017 at 6:05 pm. 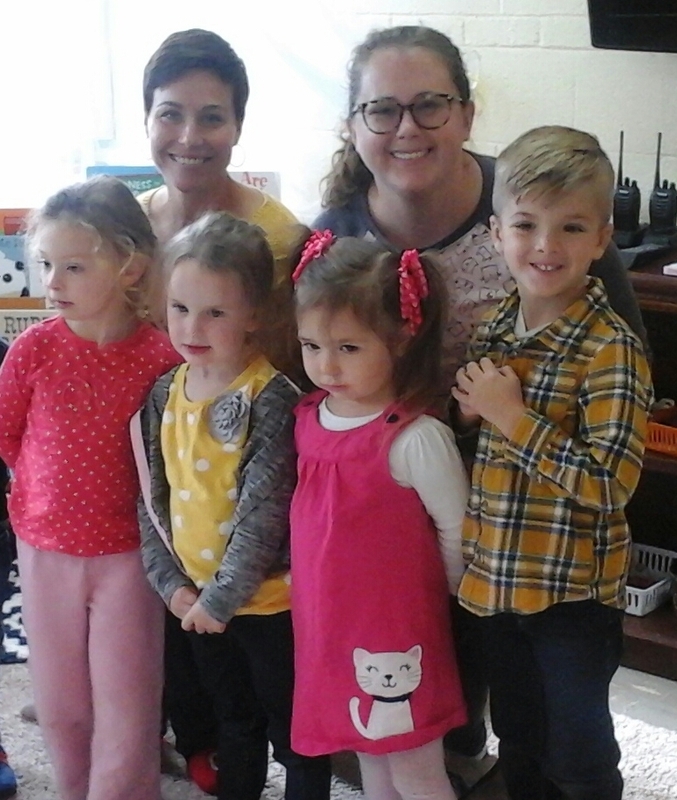 This week, we learned all about Families! 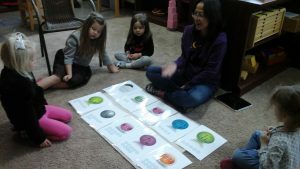 We learned ASL signs for Mom, Dad, Sister, Brother, Grandma, and Grandpa. We also read about how families come in differents sizes and can be made up of different types of people! Working on the Corn Tweezing work together! This has been a very popular work in our classroom! By using the tweezer to pluck the corn, the child is developing their pincer grip, which is great preparation for Handwriting! In addition, the child is developing their focus and concentration! Ms. Mel practiced counting using Chinese numerical characters with our students during Afternoon Group Time this week! 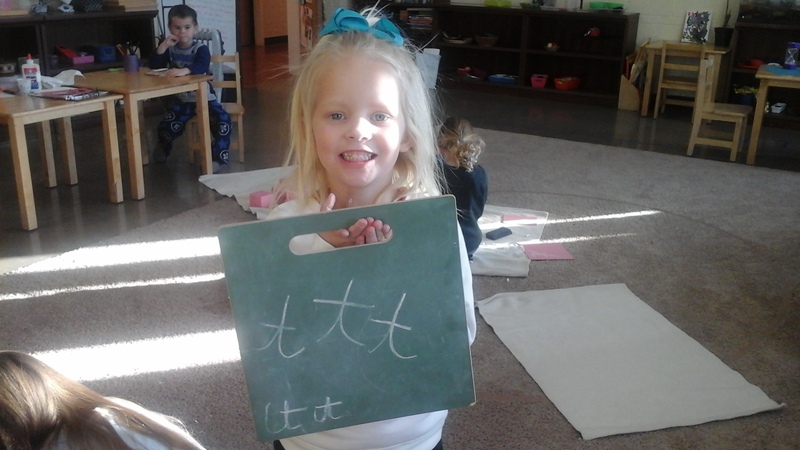 We also learned the words for members of our family in several languages! 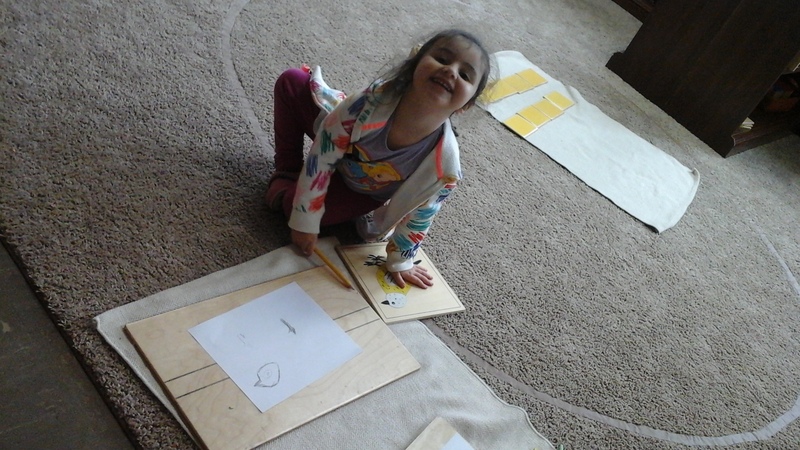 Working on tracing the Bird Puzzle! Puzzles are a great pre-reading material! -How can we be kind to others? 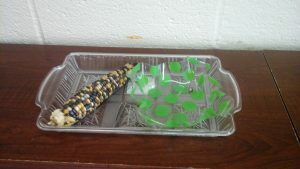 -Doing something kind for another class, now that our Kindness Jar is full! Posted on October 27, 2017 at 6:42 pm. This week was a blast! We learned all about Bats and other animals that might be considered ” creepy”. We read the book ” Stellaluna” , which tells the story of little bat who is adopted by a family of birds, which led into our discussion about the differences between bats and birds and we learned about the Parts Of The Bat. 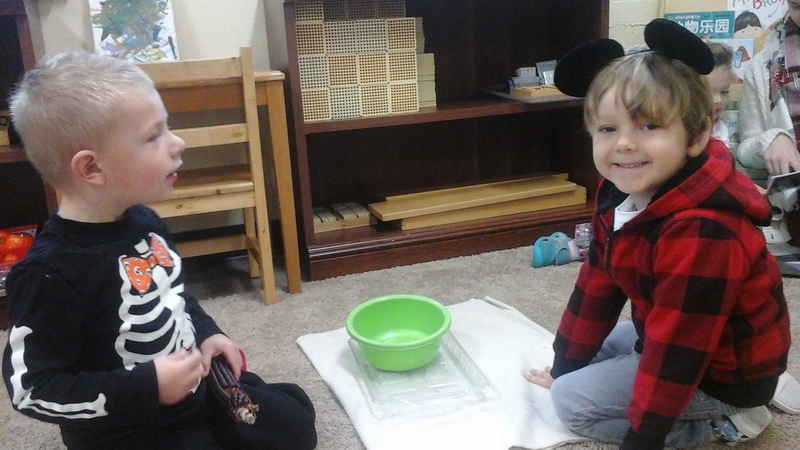 We also had a wonderful time at our Halloween Party! 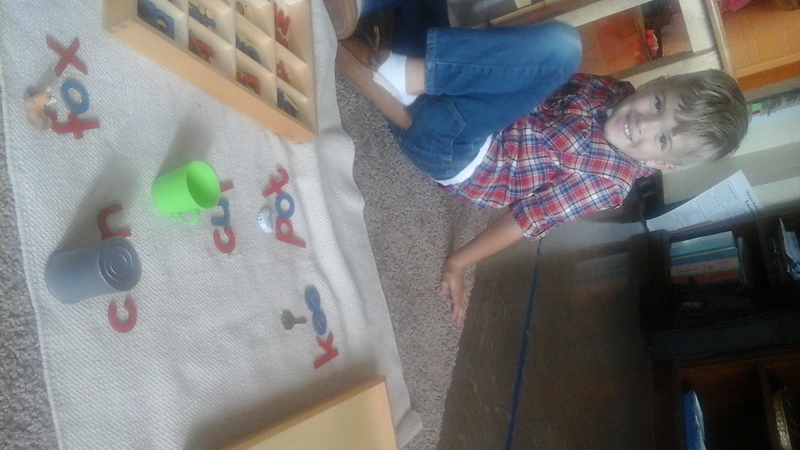 So proud of his work on the Movable Alphabet! 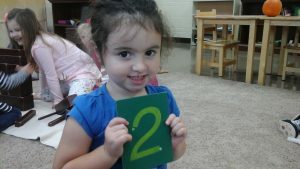 The child uses this work to begin to learn to phonetically spell! Perfecting her sense of touch using the Touch Boards in the Sensorial Area! By using these, the child learns the difference between rough and smooth and learns to grade from smooth to rough! 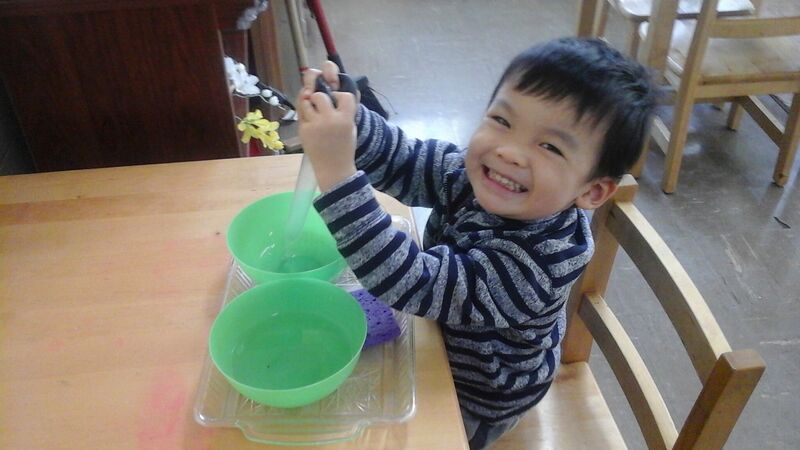 Working on the Scooping work in the Practical Life Area! 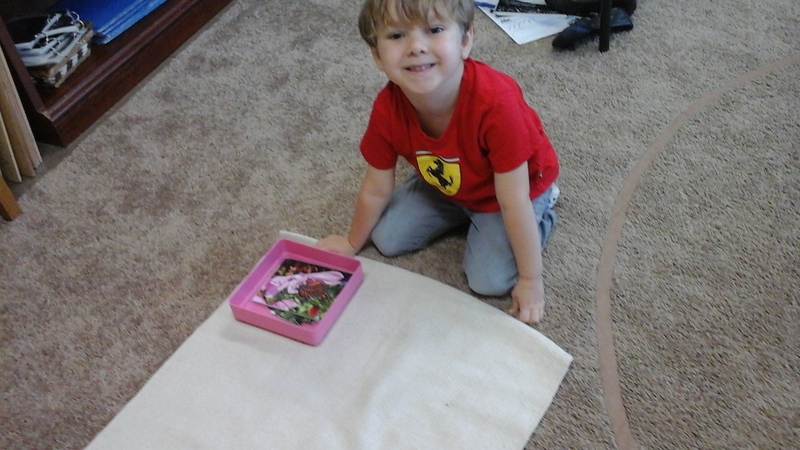 By using this material, the child develops their sense of order, concentration, coordination, and independence. By scooping the stones from left to right, the child is also is indirectly preparing their brain to read! -Discuss Family traditions and celebrations. -Discuss how every family is unique and special. -Discuss how pets are also part of our families. Posted on October 20, 2017 at 5:53 pm. 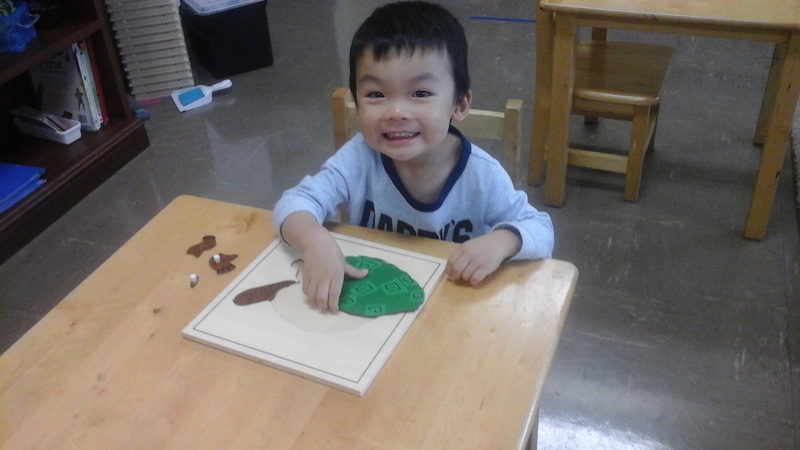 This week, our class enjoyed learning all about leaves! They enjoyed learning about the parts of a leaf, why the leaves change color, and we even enjoyed shading leaves with crayons! We also learned about the season of Fall! We had so much fun! Working on the Parts of The Turtle Puzzle! Working on puzzles aides the child in their preparation to learn to read! 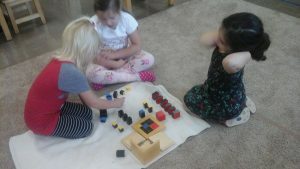 This is what Montessori is all about! 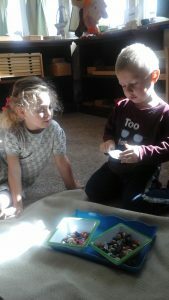 An older child sharing their knowledge with their younger friends! This sweet girl is showing her friends the Trinomial Cube! This material is great preparation for Algebra later down the road! Our friends enjoyed having our first Guest Parent Reader come into the classroom to read us a spooky Halloween story! -Learning the parts of the Bat. -Learning about echolocation, and how it helps certain species of bats see in the dark. -Making a Ven Diagram comparing bats to birds. Posted on October 13, 2017 at 3:53 pm. This week was a lot of fun in our classroom! 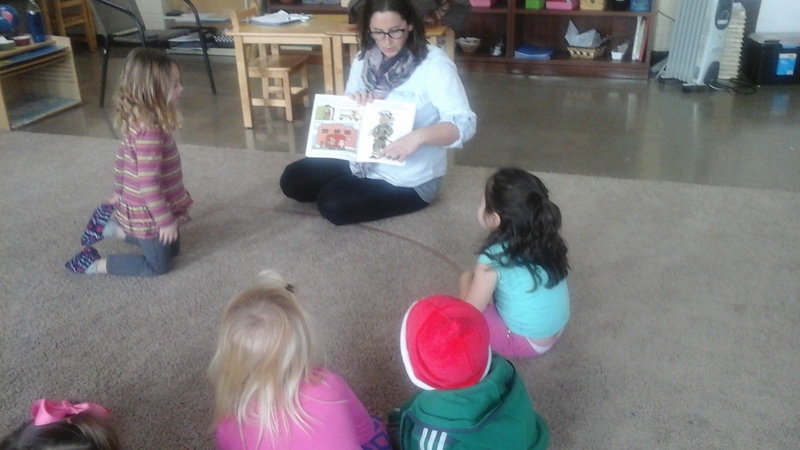 We learned all about pumpkins, the parts of the pumpkin, and we also learned the song “Five Little Pumpkins”! 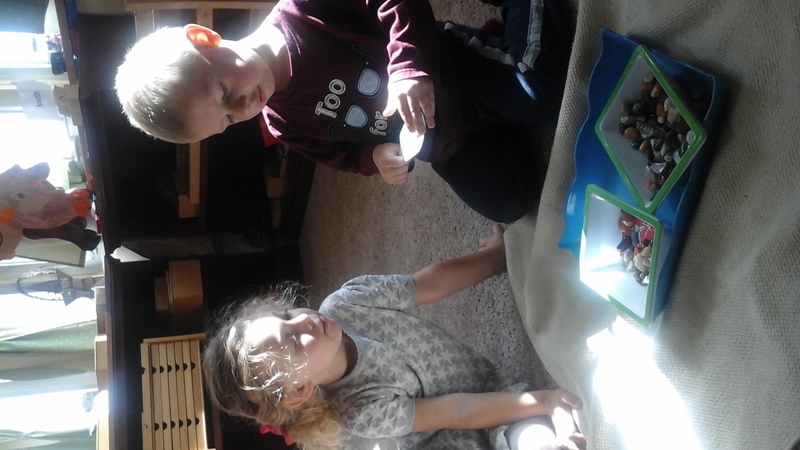 We even enjoyed making pumpkin muffins together! 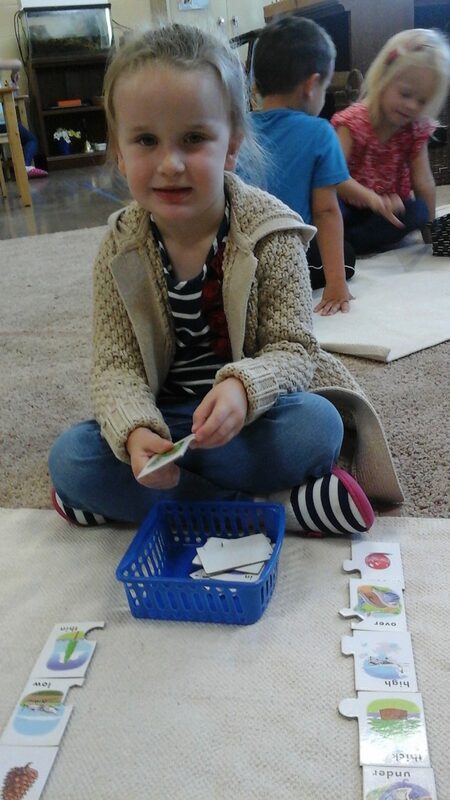 Working on the Sandpaper Numbers! The child traces the number and says the name of the number outloud to practice their numerical symbols 0-9! With fall now here, the Button Frame is the perfect work to help our students practice buttoning and unbuttoning! This work also aides them in increasing their concentration, coordination, and independence! Working on the 45 layout! By working on this material, that child learns numerical order and how to count by 1’s , 10’s, 100’s, and 1000’s! -Learning all about the parts of the leaf. Posted on October 6, 2017 at 4:46 pm. 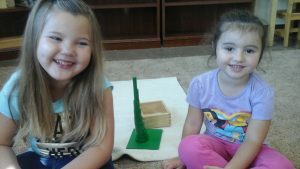 This week we learned All About Farm Life! 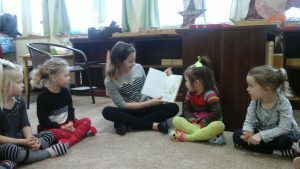 The children enjoyed learning all about what animals live on a farm, what farmers grow, and some ASL and Spanish words for farm animals. The children also enjoyed watching a video clip of a baby chick being born and making their own butter to taste test! So much fun! Working on the Part To Whole material from the Language area of the Classroom! Much like putting a puzzle together, using this material is great preparation for reading! 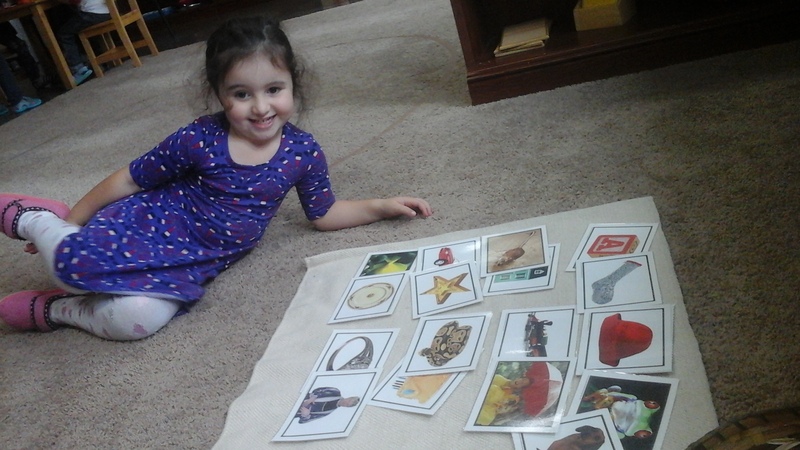 Proud of her work on the Opposite Cards in the Language Area of the classroom! 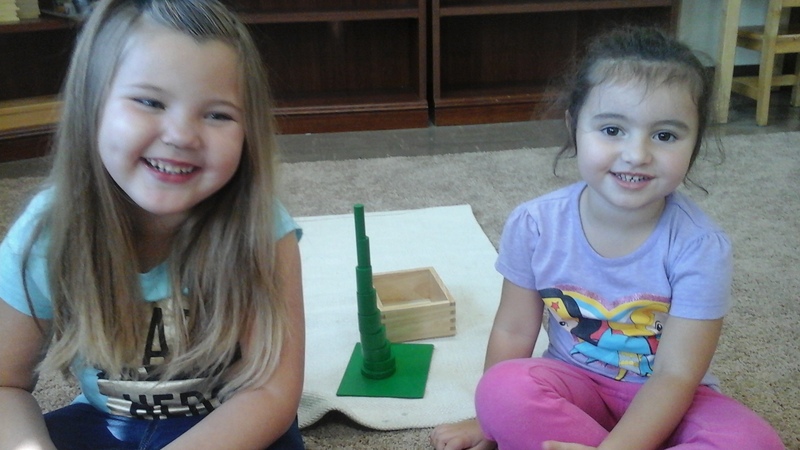 The Green Knobless Cylinders, bringing two friends together to learn how to build shortest to tallest, which is great preparation for Math! Posted on September 29, 2017 at 2:03 pm. This week our classroom was very busy and full of fun! We learned all about community helpers. The children enjoyed learning what a community helper is and the different jobs they can have. We learned that police keep us safe. We also learned that without construction workers we wouldn’t have our school building. We also enjoyed having parents come and speak to our class about how they help our community! The children also enjoyed learning some words in French with Ms. Mel during afternoon group time. Proud of his work on the 100 Board! 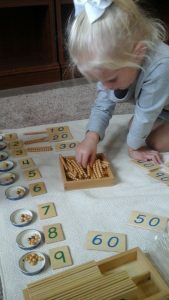 This work aids the child in counting from 1 to 100 and aides them in mastering numeration. 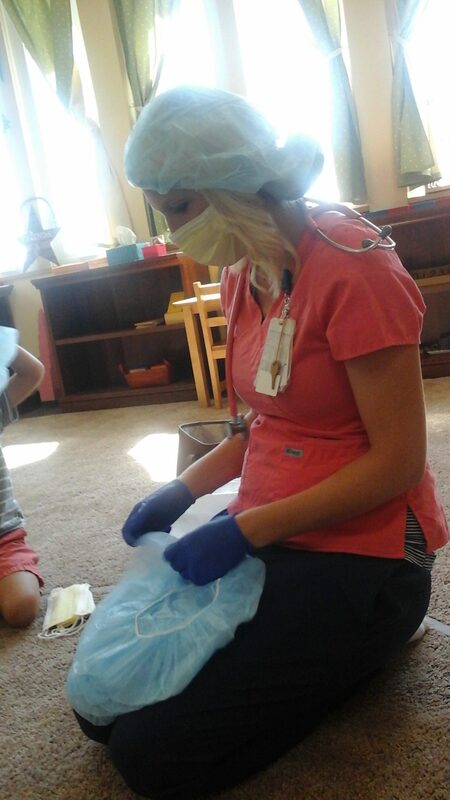 This classroom visitor came to speak about what it is like to be a nurse at Akron Children’s Hospital! The children tried on hats and gloves that nurses wear and listened to their heart beats with a stethoscope (here you can check out the best stethoscope for doctors 2018)! 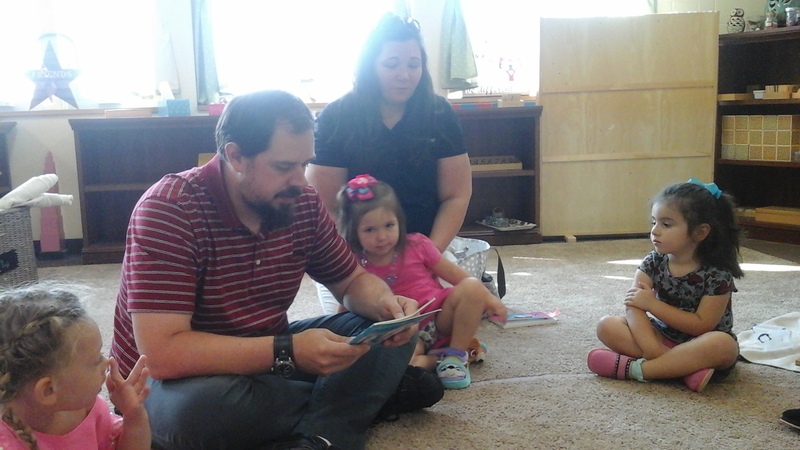 Another student’s family came and shared with or class as well! Dad is a High School Writing Teacher and Mom is also a Nurse. He shared with us about the different types of characters you may find in a story. She shared with us how she goes to people’s houses and helps to take care of them and if the house is not in great state she also help by recommending affordable sites as http://www.palmbeachroofingexpert.com/palm-springs-roofing/. Or they can even build houses from the groud for this, building designers are well qualified to prepare unique Home Designs, which are great for anyone who want a house. A Peek At Next Week: All about Farms! Students will learn all about what it takes to run a farm, what animals are on the farm and we will even make butter together. We will also learning ASL farm vocabulary.